The upper face is a dynamic, expressive area of the face. Da Vinci’s facial division of third gives a boundary from the hairline to the glabella areas. Farkas quantified this area as approximately 61.9mm squared. 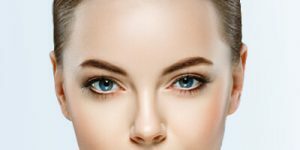 In reality, because it is in a region of expressions, emotions and personality, the upper face should include the forehead, brows, glabella, upper eyelids and up to the lateral canthal ligaments. Any rejuvenative attempts should consider these anatomical boundaries in the planning process. The areas to consider are the aesthetics of the forehead, shape of the eyebrow, upper lid contour and the quality of the skin. The clinical presentations needing upper face rejuvenation are the quality of the skin, the multiple lines of the forehead, glabella and crow’s feet, lateral and medial brow ptosis, hooding of the upper lid, medial fat herniation and prominence of the lachrymal glands. Any facial rejuvenation process should involve a variety of techniques so that the outcome should provide a more natural unoperated look. The Hollywood wind tunnel effect plumped upper lips, wobbly chin implants are features which gives aesthetic facial surgery a low perception amongst the surgical community. The aesthetic reconstruction should aim to provide a pleasing outcome. In order to provide such outcome, the surgeon should understand how to improve the skin quality and the ability to carry out surgical and nonsurgical procedures. The balanced result is akin to a gourmet dish where the components are not visible but the final product is all that matters. There are three basic ways the shape of the forehead can be altered. Shifting the forehead backwards to elevate the brow by surgical intervention. The myotomy will be limited to the glabellar muscles and this can be achieved on its own via a trans upper blepharoplasty approach and chemical denervation by serial injection botulinum toxin. In summary, the upper face rejuvenation involves correction of intrinsic and gravitational changes. The intrinsic quality can be improved by nourishing skin cuticles such as vitamins, hyaluronic acid and other antioxidants. In order for the patient to achieve a natural look, upper facial rejuvenation should work with other treatments holistically. The Nd Yag laser will also help in rejuvenating the dermal collagen and elastic fibres of the upper facial area. The gravitational changes are caused by a combination of ageing and photodamage. The lasers in resurfacing mode can remove the superficial layers and can promote dermal rejuvenation. The fractional and smooth modes of the Fotona laser system has a lot to offer in these areas. The muscle overactivity can be selectively controlled by botox and volumizing can be achieved by fillers such as patients own fat or products based on hyaluronic acid. Surgical correction includes open and endoscopic techniques. Open approach has various modifications which should be tailor-made to the patients need and surgeons expertise. Upper blepharoplasty should be considered as an associated procedure in upper face rejuvenation. Fixation techniques in endoscopic approach are varied but usage depends on the surgeon’s preference and expertise as no study supports one’s superiority. The final goal should be to achieve an unoperated outcome with a healthy looking forehead.